Take credit cards in MyCase. The practice management platform MyCase already has the ability to accept online payments directly from a client’s checking account. At the recent ABA Techshow, MyCase announced that its payments feature will be expanded later this year to include a built-in credit card option. It will allow users to accept credit card payments through MyCase for a flat 3 percent transaction fee. For a short video showing how MyCase Payments works, see here. Clio gets new call services. Practice management platform Clio announced two integrations at Techshow that provide enhanced calling services for its users. The first is an integration with the VoIP telephony company Vonage Business. The integration allows firms that use Vonage as their business phone system to have all incoming and outgoing calls automatically logged in Clio, showing each call’s date, time and duration. Once logged, the call can be associated with a contact or a matter and a time entry created. 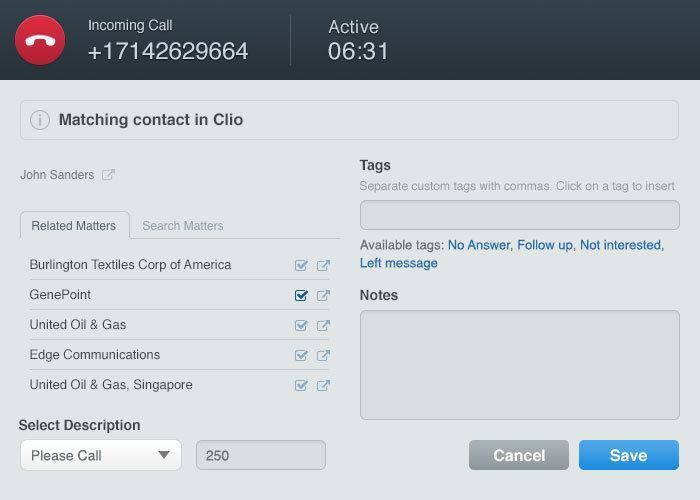 The integration also enables click to dial from within Clio. The integration works with all phones — desk, softphones and mobile. It uses Vonage’s middleware product gUnify to connect Vonage and Clio. Because gUnify is cloud-based software, it works without any special hardware or software required of the law firm and can be quickly set up. The second integration is with Ruby Receptionists, a company that offers live, remote reception services for the legal industry. With the integration, messages and voice mail notifications from Ruby are sent directly to a lawyer’s or firm’s Clio account. And Lexicata now also integrates with Ruby. Lexicata, the cloud-based CRM and client-intake software for law firms, has also announced an integration with Ruby Receptionists. Now, when a Ruby receptionist answers a call for your firm, he or she will be able to take down the caller’s name, email, phone number, and some basic call notes into a webform. The data will be captured into theLexicata Inbox and the firm will receive an email notification. From there, the firm can “Quick Intake” the lead and set up a new matter in Lexicata with a couple of clicks. The call notes will be saved as a matter note, and their contact info will be pre-populated to really streamline the process. Tackling legalese. No doubt many of you have heard of or even used WordRake, a legal-editing add-on for Microsoft Word and Outlook that can help tighten your writing. I’ve learned that the next release of WordRake, coming out later this year, will go even farther. The next version will have two separate functions. One, called Clear and Concise, will do what WordRake now does. The new function, called Plain Writing, will tackle legalese, suggesting ways to eliminate obtuse and legalistic language. If you’re not familiar with WordRake, see my reviews of version 1.0, in which I tested its ability improve the writing of Justices Scalia and Kagan, and version 2.0, in which I tested it against the plurality, concurring and dissenting opinions in McCutcheon v. Federal Election Commission. A job board for legal tech. Evolve Law, a for-profit organization launched last September to help drive technology innovation and adoption in the legal industry, has introduced a job board. The job board features job openings at Evolve Law member companies. Among the current listings are jobs at Abacus Data Systems, Allegory Law, Avvo, Contactually, CosmoLex, Hire an Esquire and LegalZoom. In conjunction with the job board, Evolve Law plans to stage a series of career fairs around the country. And also from Evolve Law. A new podcast, looking at innovation in the legal industry through interviews with company executives involved in legal startups. A matching site for A2J projects. A2J Author is a tool used by legal aid programs, courts and others to create automated guided interviews to help direct individuals in need of legal help. (I previously wrote about it here.) Last week, A2J Author’s developer, the Center for Computer -Assisted Legal Instruction (CALI), announced the new A2J Project Matching Portal. The portal helps connect legal aid organizations and courts that are looking for help creating A2J projects with teachers of A2J Author courses who are looking for student projects. An organization posts a project request to the site and law faculty browse available projects and contact any they are interested in helping with.